Piercing tools from Ditch Witch, Footage Tools, TT Technologies, Allied Construction Products and Hudco Mfg. Compact track loaders from John Deere, Komatsu, Caterpillar, Ditch Witch, Bobcat, Kubota Tractor Corp., Case and New Holland. Trenchless pipe replacement methods as available from TT Technologies, TRIC Tools, Ditch Witch, Tenbusch and Nowak Pipe Reaming. Want to know what's happening with leaders in the underground construction industry--what they can do, where they can do it, and what's next? Check out the 2010 Capabilities Guide, where companies show off their strengths and innovations for the underground market. Need more information than you find here? 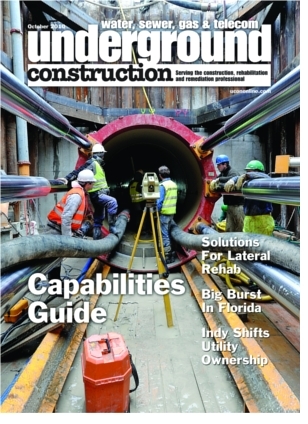 Don't forget to investigate the <a href="http://buyersguide.undergroundconstructionmagazine.com/">buyer's guide</a>. Early in 2011, ownership and operation of the water and wastewater utilities of the city of Indianapolis will shift from the city to a charitable trust, the Citizens Energy Group, which was established more than 123 years ago by the municipal code as the department of utilities. In many American cities, the sanitary sewer laterals that connect homes and commercial structures to sewer main lines have been allowed to deteriorate and become a significant source of sewer system inflow and infiltration (I&I), along with other problems. Following tropical storm Fay in 2008, Tallahassee’s 36-inch fiberglass resin force main, originally installed in 1985, failed in three places after 14-inches of rain fell within a 24-hour period. The three breaks occurred within a two-mile section of the force main that runs beneath the Capital Circle Roadway, a Florida Department of Transportation (FDOT) roadway that is one of the most heavily traveled in the city. Sekisui SPR Americas, LLC has developed equipment for installing spiral-wound pipe inside damaged or deteriorating host pipe without the need for personnel to enter the pipe. Lining old pipes with spiral-wound pipe is a proven method of trenchless rehabilitation that is used worldwide. Until now in the United States, installing SPR profile spiral-wound pipe has been a man-entry process, limiting its application to pipes large enough to accommodate personnel. Ritchie Bros. Auctioneers, the world's largest industrial auctioneer, will be selling a professional-driven 1991 Pontiac Grand Prix NASCAR race car in an unreserved public auction being held at the company's permanent auction site in Houston, Texas November 3 - 4. A 1998 Jaguar, a 1978 Corvette Indy pace car and a Bentley are other specialty cars also being sold along with 2,300+ heavy equipment items on auction day. More information is available at www.rbauction.com. RS Technik AG, a world leader in trenchless pipe rehabilitation and repair solutions, has launched a new website, www.rstechnik.com. Aries Industries has been instrumental in helping the Chilean government successfully locate a group of trapped minors using an Aries deep well camera system. The families and rescuers of 33 trapped Chilean miners were finally able to view their loved ones due to the Aries’ camera. The camera system has been used in coal mine disasters in this country and was made available to Chilean rescuers. JCB’s 3CX Backhoe Loader has earned a world record by completing a 26-day, 3,185-mile road trip across America. The epic “Backhoe Across America” fundraising trek beat the existing record for “The Longest Journey in an Excavator” by 600 miles and has secured the company a place in The Guinness Book of World Records. If you are looking for a smaller truck-mounted hydro excavator, Super Products has recently added a new unit that features a 6.5 cubic yard debris dump body to its line of Mud Dog products. McCormick Systems has designed software to serve contractors who work on the national, regional and local transmission and distribution power grid. Gehl VitalTRAC fluid analysis program is a valuable preventative monitoring tool that can protect equipment owners from expensive equipment down-time. The Leica PowerDigger Lite is a new entry-level single-slope guidance system for all types of mini excavators and backhoes. With a down economy still challenging Deere’s customers, the company has responded by increasing standard warranty coverage on new construction equipment in the U.S. and Canada. Caterpillar’s C9.3 ACERT engine has received the U.S. EPA Tier 4 emissions certification and European Union (EU) emissions type approval. The new line of TCT Series augers for heavy duty drilling projects work with General Equipment’s full line of DIG-R-TACH hydraulic earth auger attachments as well as competitive models. The new Bobcat rock buckets make quick and easy work of removing objects from the soil, sorting or sifting material and removing debris. Rain for Rent has the complete solution for pumping in potentially hazardous environments. Organized by the Ontario Regional Common Gound Alliance (ORCGA), this year’s Locate Rodeo in Ontario, Canada on June 25 was open to locate technicians throughout Ontario. Up to 40 technicians were invited to display their skills locating in once category, either gas, power, telecom and water categories. Technicians using Radiodetection locators swept the board in gas and water and took first and second place in telecom and second and third in the power divisions. CRC-Evans Pipeline International has announced that CRC-Evans has been acquired by Stanley Black & Decker for $445 million in cash. Caterpillar Inc. has selected the city of Victoria, TX, as the location for the company’s new state-of-the-art hydraulic excavator manufacturing facility. Ground breaking for the 600,000-square-foot manufacturing operation occurred in September. The facility is expected to begin production in mid-2012. Once fully operational, the facility is expected to employ more than 500 people and would triple Caterpillar’s U.S.-based excavator capacity. Gary Montgomery, chairman of the board of Montgomery & Barnes Inc., a Houston-based civil engineering and consulting services firm, announce that President Wendell (Buddy) Barnes is now majority owner. This has enabled the firm to qualify as a Service-Disabled, Veteran-Owned Small Business (SDVOSB). Montgomery will remain as chairman of the board. Advertisers from the print edition of <em>Underground Construction</em>, October 2010, Vol. 65, No. 10. Laney Directional Drilling Co. announced Oct. 12 the appointment of Kevin R. Fox as CEO. Fox joins Laney after a 19-year career with Willbros Group, Inc. where most recently he was president of the Willbros Construction division of Willbros Group, Inc. and had previously served as president of Willbros Engineering. When President Obama came out with his “bold” vision for renewing and expanding infrastructure in America, it was much lauded by the White House as a plan that combines a long-term vision for the country’s infrastructure future with new investments. Despite criticism of his company's proposed, nearly 2000-mile pipeline, Robert Jones, vice president, Keystone Pipelines, TransCanada Corporation, says he is very confident that the U.S. State Department will approve construction of the Keystone XL pipeline. The Washington Suburban Sanitary Commission seeks bidders on work including a collection of detailed repair, rehabilitation and replacement tasks within residential areas. This is the first of a series of up to six contracts the commission will publicize via its Central Bidder Registration system. Contractors wishing to submit bids or receive information on future projects should register at the commission's website, Solicitations are available from the project’s website, http://www.wsscwater.com/business/cbr/. CG/LA Infrastructure LLC, the world leader in infrastructure project identification and development, announced recently the release of the top 100 infrastructure projects in North America. The total estimated value of these projects is nearly $465 billion with a potential to create nearly 7 million full-time employment positions over the coming five years. Black & Veatch has released the results of its sixth 50 Largest Cities Water and Wastewater Rate Survey, a resource for water and wastewater utilities. The survey highlights customer charges for water and sewer service for residential, industrial and commercial customers. Scientists from the U.S. Environmental Protection Agency (EPA) and the Department of Energy (DOE) have collaborated in developing innovative water quality software that enhances a water system's ability to detect when there has been intentional or unintentional contamination. The Canary software can help detect a wide variety of chemical and biological contaminants, including pesticides, metals and pathogens. Once contamination is detected, a water utility can issue a "Do Not Drink" order to prevent customers from ingesting the water. A $7 billion project labor agreement (PLA) was signed Sept.14, by the United Association General President William P. Hite and TransCanada Corporation. In a time when the construction industry is facing record unemployment, this project will create thousands of quality jobs for the well-trained members of the United Association as well as other labor organizations for the construction of the 1,959-mile Keystone Gulf Coast Expansion Pipeline Project (Keystone XL). A subdivision in the city of San Bruno, CA, was engulfed in flames when a natural gas pipeline exploded on Sept. 9. Pacific Gas & Electric Co., which owns the pipeline, and federal investigators are probing the pipeline blast that killed at least four people and damaged 58 homes in the hilly neighborhood. Three people remain missing at the time of this report. The Pipeliners Association of Houston, Houston, TX, will be hosting their annual fall golf tournament on Nov. 1 at the Kingwood Country Club in Kingwood, TX. All proceeds from the 4-Man Texas Scramble go to the Pipeliners Association of Houston Scholarship Fund. According to a report released in August by the U.S. Department of Energy and prepared by Lawrence Berkeley National Laboratory, despite grim predictions at the close of 2008, the U.S. wind power industry experienced another record year in 2009. At the same time, the report’s primary authors and scientist, Ryan Wiser and Mark Bolinger say the combination of the financial crisis and lower wholesale electricity prices has taken a toll on the wind power industry, dampening expectations for 2010. When disaster strikes, it's nearly always without warning--and the speed of the response can be vital to its success. This summer, within a few days of the incident on the Deepwater Horizon, Thompson Pump's Emergency Response Team mobilized to the Gulf Coast to provide pumping equipment, supplies, manpower and a wealth of tactical knowledge to areas devastated by the Gulf of Mexico oil spill. The Northeast Trenchless Association (NTA) hosted its annual summer outing at Tacoma Lakes in Monmouth, ME, on Aug. 7. Over 100 members and guests from as far away as Texas attended and enjoyed a picture perfect day with friends and family. The Common Ground Alliance (CGA), the leading organization focused on protecting underground utility lines and the safety of people who dig near them, announced that underground utility damages in the U.S. decreased to an estimated 170,000 in 2009, down 15 percent from 2008, and down 58 percent from 2004. The Underground Construction Technology Association (UCTA) recognized the recipients of its college scholarships Aug. 3 at its monthly meeting. The association awarded $8,000 in scholarships to eight students.